Let me give you a quick tour of this page and some of the concepts that it introduces. This is where we modify which themes our site uses. And what attributes our themes have. If you've ever run into the idea of a skin, a theme is a similar concept. The idea is that we can retain the same functionality of our site but change the look and feel simply by switching out the theme. And there are a number of themes available to download and integrate with our site. 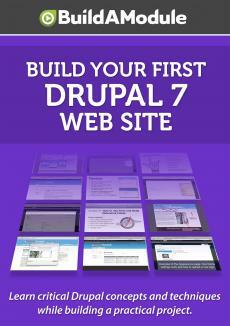 And Drupal by default, comes with several themes. So you'll see up at the very top, we have a line that says "Set and configured default theme for your website. Alternative themes are available". And if you click on this, you'll go to a section on the "drupal dot org" site that includes additional themes that you can download and install. Next we see "ENABLED THEMES". And if we scroll down we'll see another section at the bottom called "DISABLED THEMES". So our site can have both but enabled themes are the ones that are currently active. This top one, contains a screen shot, the title which is called "Bartik seven dot o", and it says in parentheses "default theme" and it gives us a description and we can click here to modify the settings, which we'll do in just a moment. But notice that we also have a second enabled theme called "Seven seven point o". There's a description and then because this isn’t' the default theme, we also have the option of disabling and setting this theme as the default. Now there a difference between your default theme and your administration theme. Notice here it says something about an administration theme. If you scroll down to the very bottom, you'll see some options for the administration theme. And you see it is set to "seven". What this means is that when we're on administrative pages, for example, this one, we'll see it in a different theme than we would front end pages that normal users to the site would see.